PRO-CLEAN-6 All Purpose Concentrate Water-Based for all Recordings Concentrate makes 6 litres of cleaning fluid with distilled water. 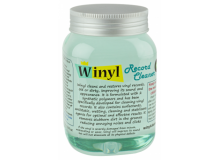 For Vinyl Records, Shellac (78 rpm), Lacquer (Acetates) and Styrene (45s). Alcohol Free, no aggressive chemicals, ..
Stylus Duo Clean Lab-21是一盒完整有效的清潔用具，適用於唱頭的精緻唱針。 盒子的內容 清潔器。 15毫升。 玻璃瓶內置軟刷帽。 沖洗液。 15毫升。 玻璃瓶。 說明（英語，德語，法語和西班牙語）。 ..